Leafs' Winter Classic Jersey Leaked? A product listing on ebay appears to show a legitimate Toronto Maple Leafs jersey, intended for the 2013 NHL Winter Classic. The game was canceled so uniforms were never released or even unveiled. That being said, it was canceled pretty late in the year, meaning merchandise like this was certainly already produced. Last month, a couple of leaked T-shirt designs showed the same logo crest. Seeing something like this tends to make us all skeptical. And I'd venture to say I fly the skeptic flag higher than anyone else when it comes to these things. So the fact that I'm taking the time to post this should tell you something. But more important than whether this is a real jersey or not is the fact that, if it isn't, it's by far and away the most convincing counterfeit I have ever seen. And it would mean counterfeiters are getting scary good. So good, in fact, that it's impossible to tell the difference between real and fake. Which is why I believe this is probably the real thing. The seller is TheHockeyJersey.co and the rest of their product catalog appears to be legitimate. However, I doubt they're officially licensed by the NHL. Because if they are, they won't be for much longer. But drop by their page, take a look at the high-resolution photos on the auction listing and judge for yourself. Thanks to Doug B. for the tip. Hi all, thanks for the comments and article about the jersey. I didn't expect quite all this when I made the listing and I didnt take the best pictures. 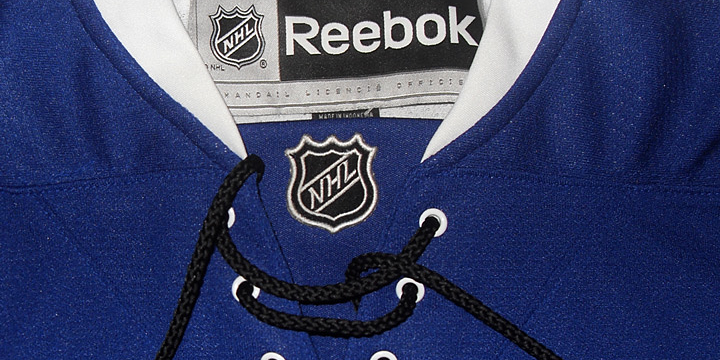 The NHL neck logo is definitely centered, it was just laying weird in the picture. I took a new picture and will be posting it to the listing soon. I can assure you it is authentic and the shield is centered. As for the black lace, it is weird to me as well. My guess is the final release would be white. Thanks again and here is a better picture. I'll level with you guys. I feel no need to help prove that this isn't a counterfeit. I'm just here to share information. You can believe whatever you like. That being said, based on my years of research and knowledge, I'm comfortable saying this jersey came out of a Reebok factory. But one commenter, Brads, makes a good point. If this isn't the jersey the Maple Leafs were actually supposed to wear to the 2013 Winter Classic, could it simply be a prototype? I'm not sure how Reebok produces their prototypes — are they usually of this quality? I might expect a prototype to be made of a lesser material just to give an overall sense of how the uniform would look. This one has an awful lot of details we see in the stuff on the rack. Lastly, there were other commenters that made equally good points about the style of Winter Classic jerseys that are sold to consumers. They're certainly not the same as a regular team jersey you might buy. In other words, they're not the full Reebok Edge style. I remember a lot of readers complaining about not being able to purchase a Sabres Winter Classic jersey in the same style as what the players wore — that went for both authetics and replicas. So all of the questions and skepticism is certainly warranted. 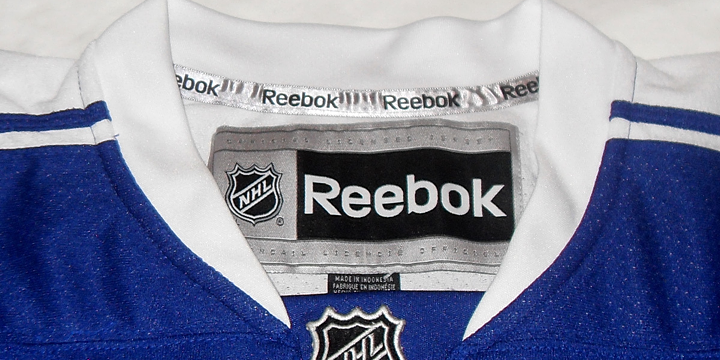 But again, from everything I've seen over the years, I think we're looking at a genuine Leafs jersey from Reebok. This is what would've been worn on Jan. 1, 2013 — and it's probably what will be worn on Jan. 1, 2014. Only time will tell for certain. Connecticut Whale to Be No More?